Succulents aren't just for planting - you can also use them for making incredible flower arrangements - in some cases, these displays can last for weeks - without any water! Here is a little mixed arrangement, using the broccoli-like blooms of Sedum 'Autumn Joy', rosettes of the burgundy coloured Sedum 'Dragon's Blood', a small dark red Sempervivum, some Oreganum with hot pink blooms, pink September blooming Chrysanthemum, red Orach seed heads, rose hips from Rosa glauca - the red-leafed rose, and fall leaves from Syringa palabin, the Miss Kim lilac. 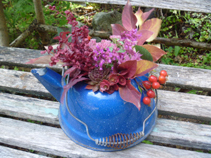 The colours sing in combination with the bright blue of the old enameled kettle, and each other. The latest buzz in the wedding world is to use succulents as wedding flowers and favors. If a succulent wedding is in your future, consider using the hardy and highly under rated Sempervivum in your wedding bouquet. Those colors just POP out of that blue kettle, what a great idea! !